Q1 (an abbreviation of Queensland Number One) is a 322.5-metre (1,058 ft) skyscraper in Surfers Paradise, Queensland, Australia. 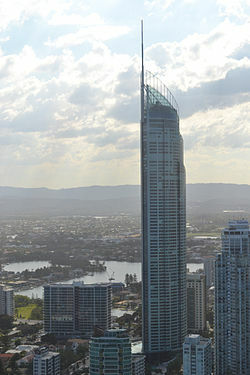 The residential tower on the Gold Coast lost its title as the world's tallest residential building to the 337-metre (1,106 ft) The Marina Torch in Dubai on 29 April 2011. It is now the sixth-tallest residential tower in the world and is the tallest building in Australia and the Southern Hemisphere, and the second-tallest free-standing structure in the Southern Hemisphere, behind the Sky Tower in Auckland, New Zealand. The Q1 officially opened in November 2005. The landmark building was recognised as one of Queensland's icons during the state's 150th-birthday celebrations. At 322.5 metres (1,058 feet) and with a roof height of 245 m (804 ft), Q1 qualifies as the world's seventh-tallest all-residential building when measured to the top of its structural point (spire), but is ranked lower behind buildings including The Marina Torch at 337 metres in Dubai and Melbourne's Eureka Tower (roof height of 297.28 m (975.3 ft)) when measured to its roof height and highest inhabitable floor. However, according to the ranking system developed by the U.S.-based Council on Tall Buildings and Urban Habitat, the main criterion by which buildings are ranked is the height of the top of the spire, qualifying Q1 as the taller. When the Q1 was completed it overtook the 21st Century Tower in Dubai, United Arab Emirates to become the world's tallest residential tower. It is as of December 2011[update] in the top 50 tallest buildings in the world when measured to its structural point, dwarfing the Gold Coast skyline with the closest buildings to Q1's height being the 220-metre (720 ft) North Tower of Circle on Cavill and the 243-metre (797 ft) Soul building. Q1 Tower was designed by SDG & The Buchan Group, and its form was inspired by the Sydney 2000 Olympic torch and the Sydney Opera House. The name was given in honour of members of Australia’s Olympic sculling team of the 1920s – Q1. The concept was based on studies of wind, movement and tension in which a series of ribbons wrap concentrically around the tower form and hover above the entry plaza area providing cover and shading. The tension in the movement and free form are expressed by the gradual twisting of the aluminium-clad ribbons as they move around the building. The result is an open-air galleria-like shopping precinct under the glazed ribbon structure and a curved retail façade to the street edges. The project was developed by The Sunland Group and built by Sunland Constructions. The building was the Silver Award winner of the 2005 Emporis Skyscraper Award, coming in second to Turning Torso in Sweden. Q1 was completed towards the end of 2005. Its main point of difference to other high-rise in Surfers Paradise is its glass-enclosed sleek look. Q1's lift lobby is separated into two high-speed lift groups. Four high speed lifts service levels B2 to level 42. Three separate high-speed lifts service levels 43 to the penthouse on level 74. The building is supported by 26 piles, each two metres (six point six feet) in diameter, that extend 40 metres (130 ft) into the ground passing through up to four metres (thirteen feet) of solid rock. Q1 contains one-, two- and three-bedroom units. Building facilities include two lagoon swimming pools, a lap pool, gymnasium, small theatre, a ballroom and a spa centre. An application to construct a walkway around the outside of level 78 was lodged with the Gold Coast City Council in mid-2010. In 2009 as part of the Q150 celebrations, Q1 was announced as one of the Q150 Icons of Queensland for its role as a "structure and engineering feat". SkyPoint, formerly known as QDeck, is an observation deck at levels 77 and 78. It is Australia's only beachside observation deck and has room for 400 people. It towers 230 metres (750 ft) above the Surfers Paradise beach, giving viewers a 360-degree view of Brisbane to the north, the Gold Coast hinterland to the west, Byron Bay, New South Wales, to the south and the Pacific Ocean to the east. The express elevator to the observation deck travels the 77 floors in 43 seconds. In 2009, reports of disrepair and poor building conditions emerged. Peeling paint which has revealed rusty steel inside and outside, as well as shattered glass panels are amongst the visible concerns. The Building Services Authority has confirmed it has received complaints in relation to the building. The north stairwell was assessed as defective due to the stairwell pressurisation system not meeting the minimum air-flow requirements during a fire emergency. The Building Services Authority asked Q1's builders to rectify the problem in July 2010. Q1 has been used as a fireworks launch site during New Year's Eve celebrations. The building is one of the most popular destinations for students celebrating schoolies week, despite the body corporate committee treasurer's claims that most of the building's unit owners were opposed to their stay. On 28 March 2007, two BASE jumpers made an early morning and illegal jump from a northern side apartment. The skydivers pleaded guilty in the Southport Magistrates' Court and were fined A$750 without a conviction being recorded. At 270 metres (890 ft), the SkyPoint Climb at Q1 is Australia’s highest external building climb. ^ GmbH, Emporis. "Q1 Tower, Gold Coast City - 101921 - EMPORIS". www.emporis.com. Archived from the original on 9 April 2013. Retrieved 23 March 2018. ^ a b c d e f g Kevin Pilley (13 November 2008). "Q1". The Sydney Morning Herald: Travel. Fairfax Media. Archived from the original on 25 April 2009. Retrieved 20 September 2010. ^ Jaime McKee Australian Landmark Archived 25 April 2012 at the Wayback Machine. Australian Construction Focus. Focus Media Group Publication. ^ "100 Tallest Residential Buildings in the World". Council on Tall Buildings and Urban Habitat. Archived from the original on 10 December 2012. Retrieved 1 May 2012. ^ "Q1 Surfers Paradise - Holiday Insider". holidayholiday.com.au. 25 October 2013. Archived from the original on 2 September 2017. Retrieved 23 March 2018. ^ Tanya Westthorp (17 June 2010). "Q1's owners want to add thrilling skywalk up to tower's spire". The Gold Coast Bulletin. Queensland Newspapers. Retrieved 20 September 2010. ^ a b Phil Bartsch (8 October 2009). "Q1 residential tower rusting, leaking and upsetting tenants". The Courier-Mail. Queensland Newspapers. Archived from the original on 29 May 2016. Retrieved 20 September 2010. ^ Phil Bartsch (9 October 2009). "Q1 highrise stairwell 'defective'". The Courier-Mail. Queensland Newspapers. Archived from the original on 30 January 2014. Retrieved 20 September 2010. ^ "Q1 hoping to expel Schoolies". The Sunday Mail. Queensland Newspapers. 14 November 2009. Archived from the original on 6 June 2012. Retrieved 20 September 2010. ^ "$750 fine for Q1 BASE jumpers". Brisbane Times. 1 May 2007. Archived from the original on 5 October 2012. Retrieved 20 September 2010. ^ "SkyPoint Climb - Gold Coast Highest Attraction | SkyPoint". www.skypoint.com.au. Archived from the original on 9 November 2017. Retrieved 8 November 2017. Wikimedia Commons has media related to Queensland Number One. Gold Coast skyline in 2015.